A catastrophic fire has engulfed the Notre-Dame cathedral in Paris, destroying its roof, toppling the spire and threatening the remaining structure of the building. The wooden interior has been destroyed. But which other features in the 850-year-old Gothic structure make it stand out in a city of iconic buildings? The cathedral has three rose windows dating back to the 13th century, which are among its most famous features. It is unclear whether any of them has survived the fire. The first, and smallest, on the west facade, was finished in around 1225 and celebrated for the way the glass seemingly upheld the stonework around it. The south rose has a diameter of nearly 13m (43ft) and is made up of 84 panels. However, it no longer retains its original stained glass because it was damaged in previous fires. Most visitors to Notre-Dame will spend some time standing before two Gothic towers which crown the western facade of the cathedral. Work on the western facade began in 1200, but the first tower — the north one — was not completed until 40 years later. Ten years after that, in 1250, the southern tower was completed. Both towers are 68m high, and climbing the 387 steps gives panoramic views of Paris. Anyone feeling fit enough to climb the stairs and gain views across Paris will have to pass another of the cathedrals best-known features — the gargoyles. These mythical creatures are typically composed of more than one animal. The most famous — known as the "Stryge" gargoyle — sits on top of the building, watching out over the city with its head in its hands. The cathedral has 10 bells — the largest, known as Emmanuel, weighs over 23 tonnes and was installed in the south tower in 1685. Each was blessed with the name of a Saint to replicate the original bells that were melted for cannon balls during the French Revolution. Writer Victor Hugo used the cathedral as a setting for his 1831 work The Hunchback of Notre-Dame. His main character, Quasimodo, is feared by locals for the way he looks — but finds sanctuary in the cathedral and is employed as a bell-ringer. Notre-Dame’s famous spire, which collapsed during Monday’s fire, dates back to the 12th Century. It underwent several changes in the building’s history — including being dismantled during the French Revolution, and later rebuilt in the 1860s. 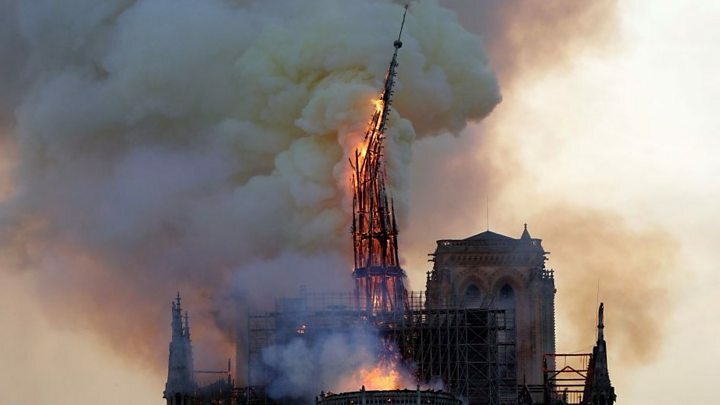 Reflecting on its collapse, Royal Institute of British Architects said: "The loss of the roof and spire of Notre Dame, and possibly the stone vault too, is an irreplaceable blow to the heritage of French Gothic architecture. "Our heart goes out to the people of France, and to lovers of our shared cultural heritage wherever they are."